Please note that, due to an excessive number of public inquiries, BC Parks Regional staff are unable to effectively respond or return every phone inquiry received concerning this park. Please appreciate that our staff are not able to assess the conditions in the backcountry on a regular basis in the winter/spring, nor are we able to predict or provide weather or current snowpack conditions. Facility and trail conditions are updated on our website as soon as we have new information to post. For information on historic weather conditions in these or other areas, please see Environment Canada: Historical Climate Data. The most common questions about the park are answered on the parks' web pages; BC Parks recommends that visitors review this information prior to visiting. If you have an inquiry that isn’t answered on our web pages, please submit your questions or concerns online. We appreciate your cooperation. In recent years, a proglacial lake adjacent to the Vowell Glacier has been forming during the summer months. This lake has the potential to rapidly fail, as it did in 2017, resulting in a glacial lake outburst flood. A proglacial lake is formed when meltwater is trapped against a glacier or dammed by a moraine or ice. The outburst flood may be triggered by the failure of the dam, a buildup of water pressure, or an avalanche or rockslide into the lake. Park visitors are advised to avoid extended travel or overnight camping in the Vowell Creek drainage between August 1 and September 30. Visitors accessing the Spires area of Bugaboo Park should be aware of ongoing directional signage vandalism occurring on the lower portion of the Bugaboo Park access route from Brisco. Visitors utilizing this access route are cautioned to stay on Brisco Road, about 5 km from the highway turn-off. Avoid travelling up the "Mine Road." This road is hazardous; it's steep, narrow, and directional guide signage may be missing in this area. The standard access turns up Westside Road, at about 8.5 km from the highway, and proceeds to the junction with the Bugaboo Forest Service Road. Alternatively, visitors can use the access route from Spillimacheen, which connects with the Brisco access route at the Brisco Road / Westside Road junction. The Conrad Kain Hut is available for overnight bookings through the Alpine Club of Canada during the operational season (end of June – End of September), when hut systems are operational, and a custodian is present. ACC advanced booking policies do not apply to the Conrad Kain Hut, all visitors are able to make bookings for this facility up to one year in advance. From November 16 to April 30, the hut is closed to all overnight use due to avalanche hazard. During the shoulder season (May 1 to end of June, end of September to November 15), a custodian is not present, all bottom floor windows are covered with protective winterizing shutters & all hut systems (water, propane, hydro, grey water) are winterized and non-functional. While use of the hut is possible during this time of the year, it is not recommended. If you do choose to visit the Conrad Kain Hut in the shoulder seasons, please; consider that the bottom floor will be totally dark (shutters cannot be removed by public), consider that there will be no water, lights, heat or cooking facilities, clean up after your group’s use, and; be prepared for rustic, winter conditions. Letters of permission (LOP) are required for winter helicopter access. For further information on visiting the park in winter and early spring, contact the Ministry of Environment office at 250 489-8540. Bugaboo Provincial Park, situated in the Purcell Mountains of southeast British Columbia, continues to draw climbers from around the world to its airy, glacier-sculpted granite spires. With many peaks over 3,000 metres in elevation, the Bugaboos offer awe inspiring mountain and glacier terrain. 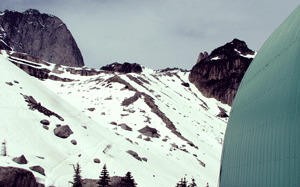 The Conrad Kain Hut is maintained by BC Parks and the Alpine Club of Canada. This base camp for climbers operates to reduce visitor impacts on the fragile timberline area below Snowpatch Spire. Road access to the park is achieved via straightforward route-finding along rough resource roads (high clearance recommended). Inexperienced or ill-equipped climbers and hikers should forego a visit here in favour of less demanding areas of the province. Bugaboo Provincial Park is a remote area. Persons intending to visit the Bugaboos must realize there are no supplies, equipment or transportation arrangements of any kind available in the park. Visitors must be prepared for outdoor living in a mountain environment. Hut accommodation is not available in winter because of avalanche dangers. It is recommended that visitors protect their vehicle perimeter with a portable chicken wire fence to deter porcupines and other small animals from chewing on rubber brake lines and tires. National Topographic Series Maps 82K/10 (Howser Creek) and 82K/15 (Bugaboo Creek) are at a scale of 1:50,000 and cover all but the western limits of the park. These maps are available from most map retailers in British Columbia. The Bugaboos – One of the World’s Great Alpine Rockclimbing Centres is a comprehensive and accurate guidebook to climbing and mountaineering in Bugaboo Park. It is written by Chris Atkinson and Marc Piche and published by Elaho Publishing (ISBN #0-9733035-1-4). Please note: Trail reports updated regularly in May-August as the trail melts. Mountain biking, fires, and domestic animals are prohibited within the park. Persons visiting Bugaboo Provincial Park should be aware that the park is a wilderness area, without supplies or equipment of any kind. All arrangements for supplies and transportation must be made beforehand. Climbers should check with the hut keepers on current conditions and destinations before departure. A register is kept in the Conrad Kain Hut for this purpose and your convenience. Climbers are responsible for their own safety; rescue services are not readily available. Public communications services are not available. Walk-in or wilderness camping is available on a first-come, first-served basis. The Conrad Kain Hut is available for overnight accommodation for a maximum of 35 persons. Reservations may be made through the Alpine Club of Canada at 403-678-3200 or through the Alpine Club of Canada website. Any unreserved spaces are allocated on a first-come first-served basis. During the peak climbing months of July and August, the hut is often full – reservations are highly recommended. Bugaboo Provincial Park is located in southeastern B.C., between Golden and Radium Hot Springs, and west of Highway 95. Access to the park is about 50km of gravel road from Hwy #95. This gravel road, which opens late spring through late fall, begins at Brisco, 27 kilometres north of Radium Hot Springs or 76 km south of Golden on Highway 95. A 4x4 is not required but a 2wd with some decent ground clearance is recommended. The last 3km section of the gravel road is rough; low-riding compact vehicles need to go slow to avoid scraping the bottom. It is recommended that visitors protect their vehicle perimeter with a portable chicken wire fence to deter porcupines and other small animals from chewing on rubber brake lines and tires. Access to the northern portions of the park via the Vowell and Malloy Creek drainages is possible by leaving Highway 95 at Spillimacheen, north of Brisco, then crossing the Columbia River and turning left on the West Side Road. After travelling 0.8 km, turn right onto Bobbie Burns Creek drainage and drive past the lodge of the same name. Logging roads up Vowell Creek and Malloy Creek lead to semi-open terrain which can be hiked into the park. The status of bridges in inactive logging areas may vary in upper drainages. Access roads are not maintained in winter. Snowmobiles are not permitted in the park and must be left at the summer parking lot. Visitors wishing to visit the park in the winter months will either need to ski the long access road or use snowmobile, as far as the summer parking lot, or helicopter access. Independent parties (non-helicopter skiing clients) require a letter of permission (LOP) to fly into the park by helicopter. Information on winter access to the park may be obtained from the Ministry of Environment office at 250-489-8540. Bugaboo Provincial Park protects an internationally important mountain climbing area 60 kilometres south of Golden. The spectacular Bugaboo Spires attract all levels of well-equipped climbers. There are a few easy to moderate routes, but most routes involve crossing the Glaciers and negotiating difficult traverses. Crampons, ice-axe and ropes are essential. There are hikes that do not require technical mountaineering skills. Trails to Conrad Kain Hut and Cobalt Lake offer superb scenic values for the experienced, physically fit and well equipped hiker. For your own safety and the preservation of the park, obey posted signs and keep to designated trails. Shortcutting trails destroy plant life and soil structure. No person shall possess a firearm, bow or crossbow in a park, conservancy or recreation area except a firearm, bow or crossbow that is carried in a vehicle and during an open season specified under the Wildlife Act and no person is permitted to discharge a firearm, bow or crossbow in a park, conservancy or recreation area except during an open season specified under the Wildlife Act and only for the purposes of hunting. Also, no person shall hunt or discharge a firearm, bow or crossbow in a park, conservancy or recreation area within 400 metres of either side of the centreline of a park road or highway. Bugaboo Park offers world class backcountry skiing opportunities. The park was the birthplace of helicopter skiing in North America in 1965 when Hans Gmoser hosted a small group of skiers at logging camp located just outside the present-day park boundary and explored the nearby mountains using a small 3-seat helicopter. In 1968, one year before the establishment of the park, the Bugaboo Lodge was constructed on the site of the logging camp and since then it has earned a reputation as one of the premier helicopter skiing destinations worldwide. The park is also renowned as a fantastic destination for self-propelled ski mountaineers. There are many classic ski tours that can be completed for parties based out of the Kain Hut basin, and the park is the starting point for the Bugaboos to Rogers Pass high-level ski traverse. Anyone considering visiting the park in the winter should be aware that the terrain is predominantly high alpine and very complex, with few safe options when avalanche danger is elevated. Because the Conrad Kain Hut can be threatened by avalanches, it is closed from November 16 to April 30 each year. Ski touring parties wishing to base camp in the vicinity of the main Bugaboo Spires (Bugaboo, Snowpatch, Pigeon etc) are required to stay at Applebee Dome campground where toilet facilities are located. The Conrad Kain Hut is available for overnight accommodation for a maximum of 35 persons. Reservations may be made through the Alpine Club of Canada at 403-678-3200 or through the Alpine Club of Canada. ACC advanced booking policies do not apply to the Conrad Kain Hut, all visitors are able to make bookings for this facility up to one year in advance. A small hydroelectric plant provides power for electric lighting and cooking, with propane stoves and lamps as backup to the electrical system. The kitchen is supplied with hot and cold running water as well as all necessary cooking and eating utensils. Foam mattresses are provided in the dormitory-style sleeping quarters located on the second floor and in the loft. Visitors must bring all other necessary equipment and utensils. A nightly, per-person fee is levied during the period June 1 – September 30. Occupancy is limited to seven consecutive days. Fees are payable to the Alpine Club of Canada. There are hot and cold water taps in the Kain Hut. To ensure drinking water is safe it must be boiled for at least 5 minutes. This park has a day-use/picnic area at the Conrad Kain Hut. A pit toilet is located in the parking lot at the trailhead. The alpine toilet facilities provided in this park are all barrel system toilets; A urine only toilet is located at the Conrad Kain Hut, two barrel toilets are located near the Conrad Kain Hut, one barrel toilet is located at the Boulder campground, and two barrel toilets are located at the Applebee Dome campground. Three remote high alpine barrel toilets are also provided for recreational climbers/mountaineers located at the Bugaboo – Snowpatch col, the base of Pigeon Spires west ridge, and one located at the East Creek camp. Where there is adequate soil (at least 6 inches) but no toilets, bury human waste and burn toilet paper, otherwise collect and deposit human waste in toilets. A restop bag system is also provided to reduce human waste impacts within the Spires climbing area. Please use these bags everywhere in Bugaboo Park that a conventional toilet cannot be accessed. A $2 donation is encouraged to help with future “restop” purchases. To prevent contamination of the water supply and damage to the sensitive alpine environment, camping in the park is not permitted elsewhere in the vicinity of the main spires (Bugaboo, Snowpatch, Crescent, Pigeon, Howsers). Bivouacking is not permitted unless circumstances dictate it’s necessity. Wilderness camping is allowed in other, more remote areas of the park, such as the Vowell Group. Leave-no-trace wilderness camping ethics should be utilized.